The Land of Enchantment holds many new experiences that beckon exploration. Whether you’re hiking through breathtaking canyons, discovering historical sites, or walking through the streets of gorgeous Santa Fe, there is something new and exciting around every corner. Thousands of people flock to the second oldest city in the country for its unique architecture, culture, and local cuisine. While you might not plan on cooking during your trip to The City Different, Santa Fe cooking classes are a great way to sample Southwestern flavors while obtaining the skills to take them back home with you. Whether you’re a beginner or an expert, these instructional experiences allow you to dive into local culture at its finest. For more information on the best restaurants, sights, and activities around Santa Fe, request our free Travel Guide today! Start Planning Your Culinary Journey! Want to master Southwestern flavors? The Santa Fe School of Cooking teaches you everything you need to know in order to improve your kitchen knowledge and skills, all while celebrating the foods of New Mexico. They host a variety of instructional classes ranging from hands-on to demonstration-based in their state-of-the-art kitchens. Discover the art of making the perfect Southwestern tapas, tamales, or the cuisine of Mexico. Check their schedule for a list of classes. The Santa Fe School of Cooking also hosts incredible culinary tours through the city. Their walking tour starts at the school’s kitchen for a meet and greet, and then proceeds to take you on a delicious journey through some of the most awarded and recognized restaurants in Santa Fe. If you have a little more time to spend in town, the New Mexico Culture and Cuisine Tour is a four-day event that explores how Native traditions and cultural influences in the region affect the culinary arts. Meet some of Santa Fe’s top local chefs and sample one of the most diverse foodscapes in the country. Los Cosas Kitchen Shoppe & Cooking School infuses the flavors of New Mexico with classic American and European influences. Decorated chef and school director John Vollertsen, known as Chef V, brings over 35 years of cooking experience to the table as he teaches you how to master the art of cooking. The class demonstrations include anything from New Mexico Cuisine to Winter Thai. This Santa Fe cooking class also features a guest chef series, giving you an up-close and personal experience with some of the top culinary experts in the city. 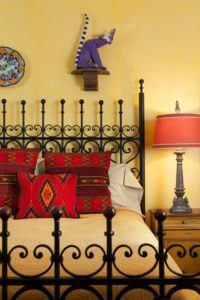 After diving into a culinary tour of the American Southwest, head back to your comfortable and luxurious room at Four Kachinas Inn. Our unique Southwestern theme provides you with authentic accommodations unmatched in the Land of Enchantment. Our prime location allows you to easily walk through the heart of historic Santa Fe, giving you access to some of the best restaurants and attractions in the area. Ready to start planning your New Mexico adventure today? Check our availability and request your free Santa Fe Travel Guide!